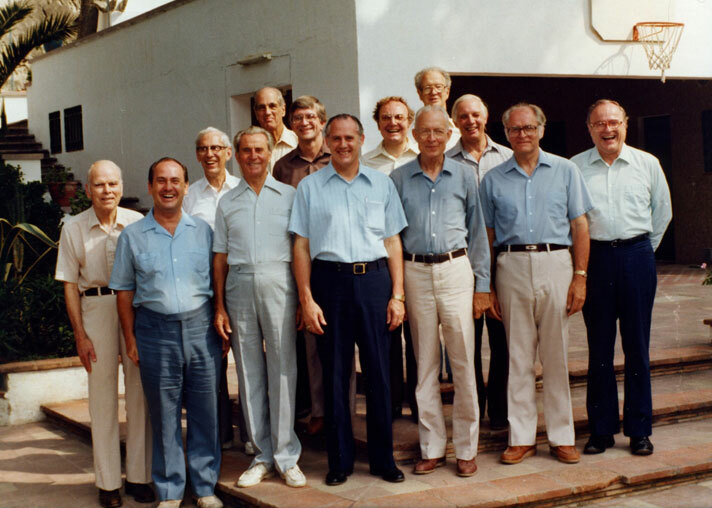 Members of the CBT spent several weeks at the Spanish Bible Institute in Barcelona during the summer of 1983 to make revisions to the NIV. The New International Version of the Bible, released in its entirety in 1978, was a thorough and beautiful work of scholarship, beloved by the many Christians who had started to use it. From the beginning, however, the translators of the NIV knew their work would need to be revised. New studies, archaeological finds and changes in the English language would inevitably call into question some of their original translation decisions. In a few decades it would no longer resonate with contemporary English speakers, if translators left it alone. The need for future updates was so obvious that the constitution for the Committee on Bible Translation (CBT) included a mandate to periodically examine and fix translation issues. In 1983, members of the CBT met at the Spanish Bible Institute in Barcelona for the first major review and revision of the text. Even though they were there to make updates, one thing was at the top of their minds: Don’t fix what isn’t broken. Any change required “yes” votes from 70 percent of the committee. This strict standard would help maintain the integrity of the text and prevent unnecessary edits. It would also serve as a check on personal opinions. A committee made up of people from across the evangelical spectrum could easily put a stop to changes that reflected denominational bias. Changes to the NIV during the early 1980s revision process include spelling and punctuation changes and clarifications to the text. 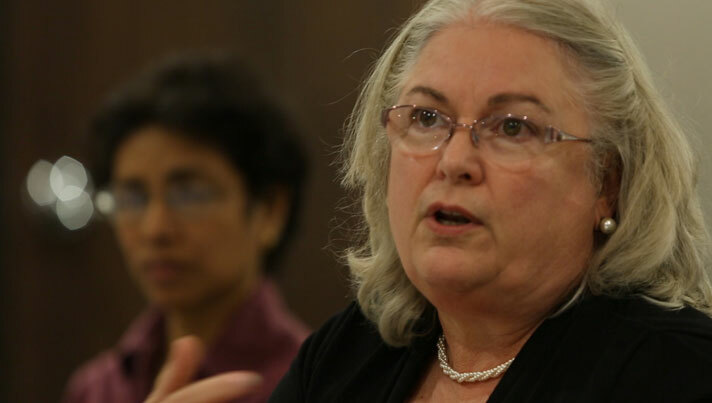 For six weeks, the CBT labored over the proposed changes. Members made adjustments in spelling and punctuation and discovered ways to make certain passages clearer for readers. Some revisions required lots of debate; others were more straightforward. At the 1983 meeting, the CBT amended its constitution to specify that the committee meet at least once every year, reaffirming its commitment to keeping the translation up to date. The group would keep up with the latest scholarship but wait to issue a revised translation for publication until a large number of changes had accumulated. Replacing Bibles could get expensive for churches and individuals, and no one wanted to unduly burden the readers. The CBT released the first revised NIV in 1984. Two years later, the translation became the bestselling contemporary English version of the Bible. The work of the CBT never ceased, despite controversy. 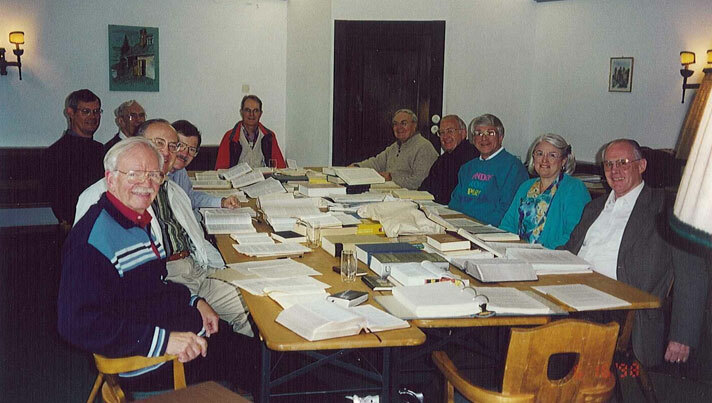 In 1998, members met in Mittersill, Austria, to continue revisions. By the early 1990s, CBT decided it was time to focus on a revision that would incorporate the best in current biblical scholarship and reflect changes in the English language. One notable change in English that the CBT felt was important to reflect was a shift in the way pronouns were used to refer to men and women. The 1978 NIV, reflecting the English of that time, used pronouns such as “he,” “his” and “man” to refer to both men and women. But the English language had changed. By the 1990s, people were often using these words in a more focused masculine sense. And this was a problem. The last thing the CBT wanted was for people to misunderstand Scripture because their everyday language had shifted. For the coming edition, the CBT decided that where the Greek or Hebrew clearly referred to all people—male and female—the translation would have to find accurate contemporary English language to make this clear. But before the CBT could release the update, a Christian magazine learned what the CBT was planning and published an article condemning the shift in language, initiating a firestorm of controversy. Some Christians were unhappy about what the CBT was planning. They accused the CBT of a “feminist” agenda when, in reality, the only agenda CBT had was to accurately reflect the meaning of Scripture in modern English. But the heat of the controversy made it hard for people to understand what was really going on. The issue became so heated that the International Bible Society (now Biblica) decided that it was not in the best interest of the translation to continue and chose not to publish the revisions. In the United States, Zondervan would keep printing the 1984 edition of the NIV. In 1997, Hodder & Stoughton, the U.K. publisher of the NIV, released an inclusive language edition of the NIV. Some members of the evangelical community criticized this edition; it was evident they did not understand the nature of the problem the CBT was addressing or the intentions of the CBT. Nevertheless, the CBT continued to work on a more complete revision that included other updates and that aimed to accurately reflect the gender references of the original languages in a manner that would be understood accurately in contemporary English. This work was eventually published in 2002 (the New Testament) and in 2005 (the complete Bible) as Today’s New International Version (TNIV). However, the International Bible Society made the decision to continue to publish the 1984 edition of the NIV. 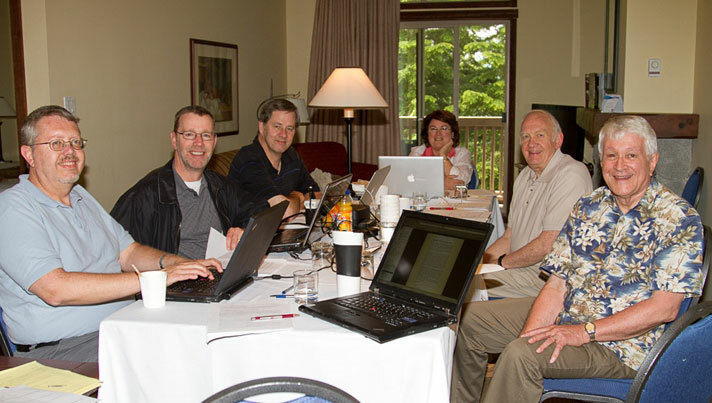 In the summer of 2010, the CBT met for several weeks in Whistler, British Columbia, to update the NIV for a 2011 release. 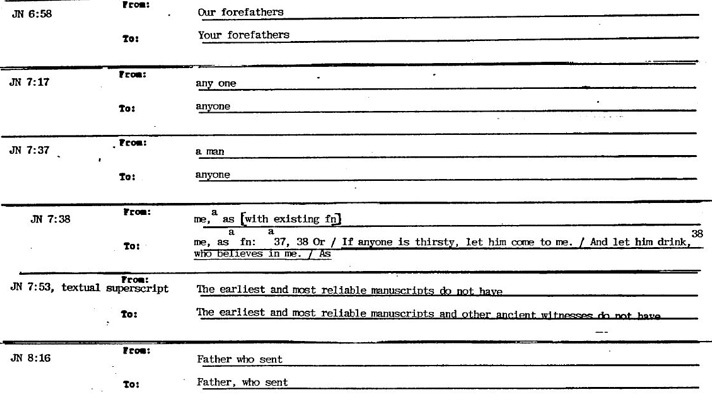 Having two editions in print of what was essentially one Bible translation was intended to satisfy the concerns of those who did not understand or accept that masculine nouns and pronouns were no longer universally understood as referring to both men and women as well as those who wanted a translation that accurately reflected contemporary usage. Though there were good intentions behind having two different editions (the 1984 NIV and the TNIV), this made it impossible for the CBT to fulfill its mandate that the NIV would be updated to reflect contemporary English usage. By 2009, it was time for a reunion. Biblica, Zondervan and the CBT announced that a new NIV revision would be released in 2011, and at that time, publication of the TNIV and 1984 NIV would cease. There would only be one NIV, and it would include all of the CBT’s approved changes. The CBT had only two years to conduct a major review and issue a revision. The pressure was on. Because the CBT had continued its work throughout the years of controversy, many revisions reflecting advances in biblical scholarship were already ready to go. But, knowing that the matter was controversial, the CBT dedicated itself to reviewing every single gender revision introduced since the 1978 edition. 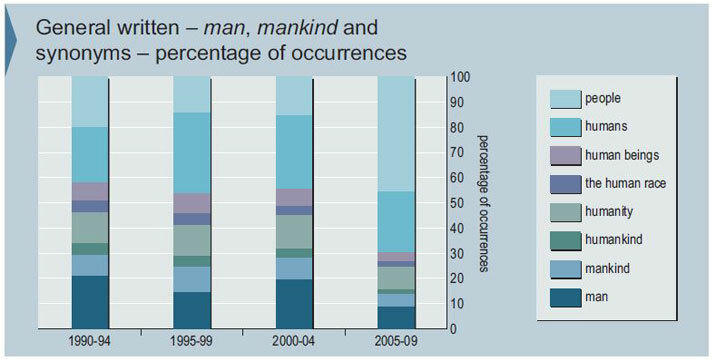 To get an unbiased view of how contemporary English referred to both men and women inclusively, the CBT commissioned a study by Collins Dictionaries to study the Collins Bank of English, a database of more than 4.4 billion words taken from recordings and publications throughout the English-speaking world. 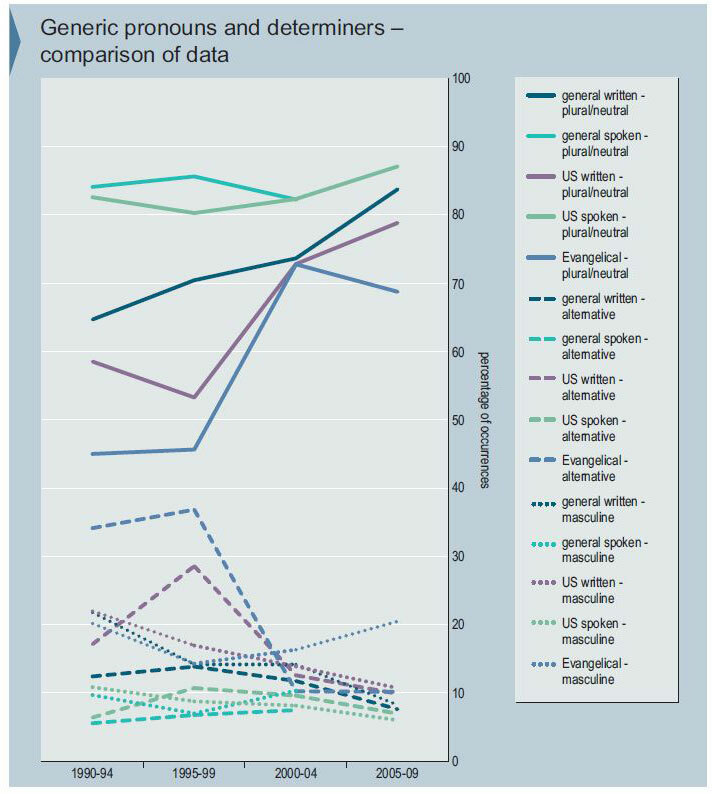 The Collins data helped the CBT understand word usage by modern English-speakers worldwide. It also demonstrated that gender-inclusive plural pronouns (“they,” “them,” “their,” etc.) were used far more than masculine pronouns (“he,” “his,” “him,” “himself”) when either an individual male or female was the intended meaning. The translation needed to reflect the English that people were actually speaking. The goal was not to be trendy. The goal was good translation. The English language has also changed in other, less obvious ways. For example, the 1984 NIV used the phrase “ankle chains” in the Old Testament to refer to jewelry worn around women’s ankles. By the 21st century, however, people didn’t think of jewelry when they heard the word “chains.” Most CBT members leaned toward changing the term to “anklets,” which was the term young women used. After dinner one evening, the members went out on the streets to test the idea. “What do you think of when we say the word ‘anklet’?” they asked passers-by. “A bracelet around your leg,” people said. When members voted on the issue, anklet received a “yes” vote. Attention to every detail of vocabulary and interpretation has helped keep the NIV accurate and comprehensible to each succeeding generation. Where to put a comma can become an hour-long discussion. Arguing over punctuation may seem trivial, but David Instone-Brewer and other members want to get it right. Bible translation involves endless study and discussion, but members of the CBT count it as a privilege. Fifty years ago, the evangelical community commissioned a contemporary English translation of the Bible. Since its publication in 1978, the NIV has blessed millions worldwide by faithfully presenting the Word of God in a way Christians and non-Christians can understand. The continual refining of the NIV helps maintain the translation as useful for reading, studying and sharing today as it was in 1978. Editions for children and adults help ensure that the NIV is a Bible translation people can use throughout their entire life. Children’s NIV Bibles such as The NIV Adventure Bible help children understand Scripture with illustrations and activities. The New International Reader’s Version helps those just beginning to read English to connect with God’s Word using simpler words and sentences. Devotional Bibles are available for women, men, students, leaders and many others, while other Bibles include devotions on specific topics such as mourning and recovery. Study Bibles with extensive notes and resource materials have been available ever since the groundbreaking NIV Study Bible was released in 1985. In August 2015, a new study Bible, The NIV Zondervan Study Bible, was released with all new notes and the latest evangelical scholarship. Regardless of which edition people use, the prayer of everyone involved with the NIV is that as people engage with Scripture, their faith will grow. The CBT continues to meet each year to maintain and update the text of the NIV.